There’s lots of discussion about how TENS can help provide relief for those who suffer from acute or chronic pain. There’s also lots of information that looks at all of the benefits of EMS for athletes. But did you know that using electrotherapy in the workplace can be just as beneficial as it is for athletes or home users? It’s true, using both TENS Unit and EMS treatment in the office has undeniably positive effects. 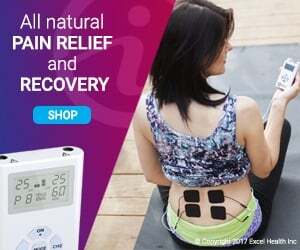 And, thanks to the latest and most advanced TENS + EMS Units like iReliev’s two-in-one device, it’s easier than ever to apply TENS + EMS Unit anytime, anywhere. Before application, however, it’s important to learn the difference between these two common electrotherapy treatments and what they’re used for. TENS (transcutaneous electrical nerve stimulation) Unit uses gentle electrical impulses to stimulate the nerves. These impulses are delivered through electrode pads, which can be placed almost anywhere on the body. The result is a pleasant, massage-like sensation which takes the place of pain. Thanks to modern advances, companies like iReliev have developed TENS + EMS Unit machines that are comparable in size to a smartphone. Though very small, these units are still extremely effective and produce excellent results. These units are quite portable, which makes them easy to use in the office. And, while there’s no need to be ashamed of electrotherapy, it helps that these units are also discreet. It’s simple to apply the pads, tuck the unit into a pocket and head into a meeting without drawing attention. Imagine sitting through those weekly meetings without shoulder pain! 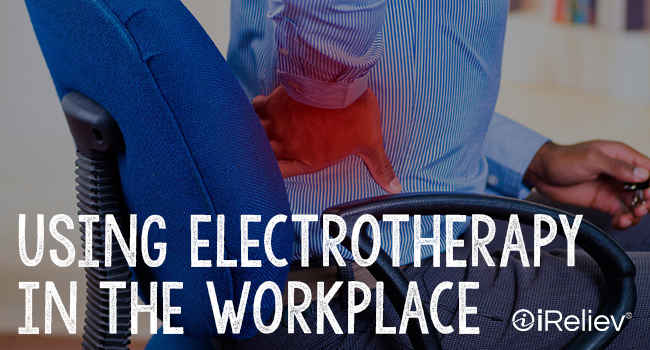 Using electrotherapy in the workplace doesn’t just mean treating pain that already exists. Applying EMS during the day will also help prevent new aches and pains. One thing that EMS does is it increases blood flow to the area. Increased circulation is very beneficial when muscles or joints are still for long periods of time. The same feature that treats atrophy or injured muscles in athletes can help you feel great throughout the day rather than becoming stiff while you sit at your desk all day. You can apply TENS + EMS Unit as often as you’d like during the workday. Get creative with its uses. You may find that using electrotherapy in the workplace greatly improves your job experience. And, who knows, perhaps you’ll start a trend!